5-hydroxy-methyl CpGs (5-hmCs) were first discovered in 2009 and shown to be enriched in the brain, but remain a mysterious epigenetic mark, despite intriguing functional findings such as: environmental enrichment’s reduction of it, MeCP2’s preference for 5mc over 5hmc, and it’s possible role as an intermediate in demethylation. This new technique will aid their characterization by allowing absolute quantification and base-resolution localization of the marks. The technique also serves as a reminder of why you should pay attention in orgo, or at least why you should collaborate with people who did! 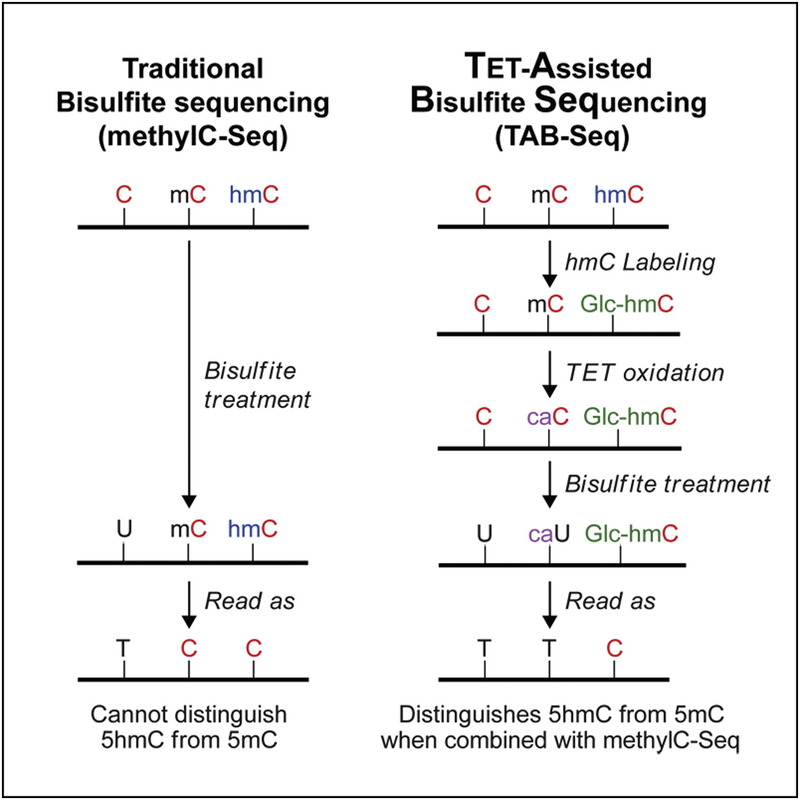 Now, Emory’s Peng Jin, has collaborated with University of Chicago chemist He Chuan to develop a new derivative of bisulfite sequencing, Tet-Assisted Bisulfite Sequencing (TAB-Seq) that distinguishes 5-hmcs from 5-mcs, as they describe in cell. Compare your first sequence to your second. You know the unmethylated cytosines from the first sequence will show up as Ts in the second sequence (because when they are amplified, they will be amplified as Thymidine not Uracil). The methylated and hydroxy-methylated cytosines which show up as Cytosines in both sequences. So, how can we differentiate 5-hmCs from 5-mCs? In a process that may remind you of all those organic chemistry synthesis problems, TAB-seq involves an extra step to protect the hydroxy-methylated cytosines from TET oxidation. Glucosylate 5hmC using β-glucosyltransferase (βGT). Treat the sample with bisulfite. This converts the Cs and 5-caCs to Us, but doesn’t effect the 5gmC. Validation of new techniques (proof that they work), is always important, and the paper shows that it works using mass spectrometry. They validated it’s practicality, by using the technique to map 5-hmCs in human embryonic stem cells (hESCs) and mouse embryonic stem cells (mESCs). In hESCs they found 691,414 5hmCs with a false discovery rate of 5%. Interestingly, though mice have similarly sized genomes, they found much higher levels of 5hmCs–2,057,636–which they hypothesize is also due to the higher levels of Tet1 and Tet2 proteins. So where are 5hmCs enriched, now that we can identify them precisely? H1 distal-regulatory elements including p300-binding sites (observed/expected [o/e] = 7.6), predicted enhancers (o/e = 7.8), CTCF-binding sites (o/e = 5.1)–CTCF is a transcriptional repressor that blocks interactions between promoters and enhancers and also plays a role in stopping the spread of heterochromatin, and DNase I hypersensitive sites (o/e = 3.4) which are associated with active gene expression. 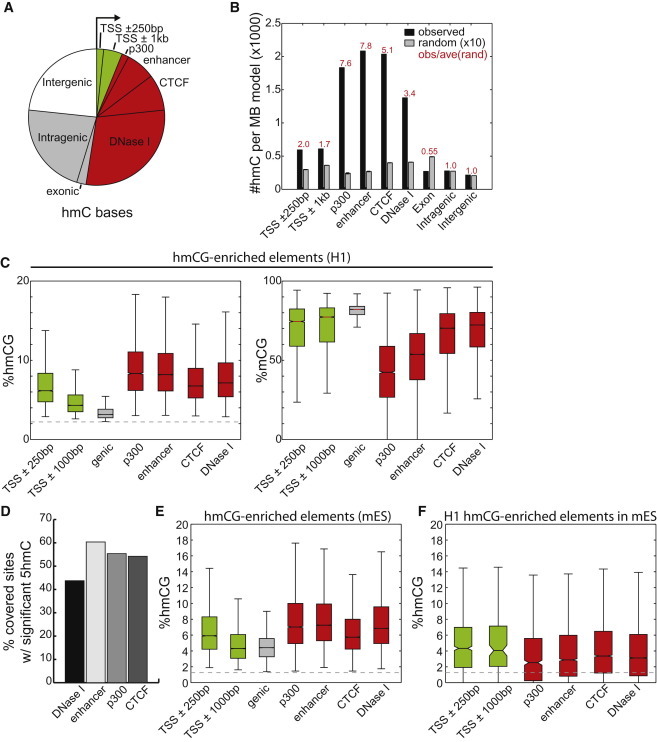 Because, 5-hmCs are enriched at enhancers, the authors speculate that 5-hmC may be specifically recognized by transcription factors as a core base in binding motifs. Genomic Distribution of 5hmC Sites. Yu (2012) Cell. Previous findings that identified 5hmCs in high CpG areas, such as CpG island-containing promoters, but these findings are likely do to the bias of mapping techniques which can amplify frequent weak signals and overshadow sparse but strong ones. The present study, found that 5hmCs tended to be enriched in lower CpG areas, especially those with H3K4me3 or bivalent (H3K4Me3 and H3K27ac) chromatin modifications, but how 5hmC interacts with the histone code is still up in the air. It will be interesting to see if the findings from, generalize to different cell-types, but since hESCs and mESCs showed similar patterns, it suggests that the regulation at least in stem cells is evolutionarily conserved. You may also be interested in the brief article I wrote previously about 5-hmCs and a paper that showed that they are highly enriched in the cerebellum and hippocampus (10x higher than in stem cells), and they increase with age. Further, the authors showed that MeCP2–which strongly binds the unhydroxylated and more ubiquitously expressed version, 5-methyl CpGs–does not bind 5-hmCs. Overexpression of MeCP2 even seems to block TETs from converting 5-mCs into 5-hmCs. Just learned about oxBS-Seq another method for sequencing, need to look into this. Does anyone know off-hand advantages/disadvantages of either? I am new to epigenetics and was looking for information on hydroxymethylcytosine. Your blog really helped a lot. Thanks!